Small town colleges offer a welcoming, communal environment for students, which often extends beyond campus to the surrounding college town. From apple-picking festivals in the fall to cherry blossom festivals in the spring, these towns integrate their college into cultural life, welcoming students to local bookstores, coffee shops, and diners. While many of the top ranking small town colleges use a liberal arts model and enroll fewer than 2,000 students, the following list also includes larger universities that call small towns home, with a mix of public and private institutions. These small town colleges stand out because they build a strong community that includes the surrounding town. Some, for example, count their campus as part of a historic district that includes the town’s downtown, while others emphasize volunteer opportunities for students in the community. Many of these small town colleges also offer students and residents access to natural beauty in the form of mountains, rivers, and forests. America’s best college towns let students escape the rigors of campus to a friendly, welcoming environment. Many of these college towns also rank as the friendliest small towns in the country. New England’s coastal Bowdoin College often tops lists of the best liberal arts colleges in the country, and friendly Brunswick, Maine helps put the college on the list of best small town colleges. Known as the gateway to Maine’s midcoast, Brunswick’s first settlers arrived in 1628 and transformed the lumber-rich area into a bustling colonial seaport. In 1794, Bowdoin College became the first college in the state. Since then, Bowdoin has built a strong academic reputation, with students completing first-year seminars and working closely with faculty throughout their degree. The active New England town of Brunswick offers students a bustling Maine Street, the beauty of Park Row, and a town commons that dates back to 1719. Just minutes from campus, students can find a farmers’ market, boutique shops, and a music store. Nature surrounds Bowdoin, with wooded trails accessible from campus and the nearby Maine coast and mountains beckoning. Bowdoin sits just 25 minutes from Portland, Maine’s largest city. Located in the Green Mountains of Vermont, Middlebury College boasts over two centuries of history. Middlebury encourages connections with the Champlain Valley community, promoting environmental sustainability and supporting culture. Middlebury offers a museum of art, runs the Center for Community Engagement, and hosts a snow bowl competition each winter. The college is dedicated to sustainability, inclusiveness, and ethical citizenship, as embodied by its internationally recognized School of the Environment, which emphasizes interdisciplinary, global perspectives. Located in the town of Davidson, North Carolina, with a population of 12,000, Davidson College boasts strong liberal arts credentials. Both the town and the college date back to 1837, and until 1891 the entire town was known as Davidson College. Today, the town’s picturesque architecture pairs well with Davidson’s classical campus architecture. The close relationship between town and college emphasizes walkability, drawing students to the historic downtown district and the Village Green. Nearby Lake Norman offers 520 miles of coastline, with the city of Charlotte only 22 miles away, giving Davidson students a small town environment with easy access to the city. With a quarter of Davidson students participating in athletics and a study abroad rate of 80%, Davidson connects its small town feel to a global society. An Ivy League college founded in 1769, Dartmouth College lives up to its reputation for academic excellence. But academics aren’t the only factor that puts Dartmouth on the map. The college also benefits from its location in Hanover, New Hampshire. In 2011, CNN Money ranked Hanover the sixth best place to live in the country, praising the small town for its close relationship to Dartmouth. Residents of the town live in scenic Victorian homes or in new buildings, enjoying the surrounding natural beauty, with skiing in the winter and hiking in the summer. Plus, the Appalachian Trail runs directly through campus. Hanover brings together a world-class college, a thriving art community, and outdoor activities. The close relationship between Dartmouth and Hanover, which keeps unemployment low and cultural activities high, make Dartmouth one of the best small town colleges in the country. Charming Northfield, Minnesota, on the banks of the Cannon River, offers hiking trails through a green arboretum, a local music scene, and Carleton College. Dating back to 1866, Carleton provides a strong liberal arts education in a small town environment. Northfield’s population of 20,000 also includes Carleton’s rival school, St. Olaf College, and the town sits just 40 miles from the Twin Cities, providing access to the amenities of a large metropolitan area. Carleton also boasts representatives from every state and 35 countries among its 2,000 undergraduates. While most Carleton students live on campus, the college shares a close relationship with Northfield, which appeared on Country Living’s list of 50 Most Beautiful Small Towns in America. Situated in a beautiful, historic city, Carleton earns its reputation as a tight-knit community of curious, cooperative students. The foothills of Mount Greylock provide a scenic backdrop for Williams College and the town of Williamstown, Massachusetts. Dating back to 1793, Williams College enrolls 2,000 students, all of whom receive 100% of their demonstrated financial need in the form of financial aid from the college. More than one in three students participate in college athletics. Williams College combines history with world-class education, ranking near the top of multiple lists of the best liberal arts colleges in the country. Williams also houses first printing copies of the Declaration of Independence and the U.S. Constitution. Sitting atop College Hill in central New York, Hamilton College overlooks the picturesque village of Clinton. Nearby, the Adirondack Park offers outdoor activities for students, or they can wander down the hill to the historic village, which dates back to the colonial era. With a student-to-faculty ratio of 9:1, Hamilton offers a personalized experience with over 50 academic programs. The college also meets the financial need of all admitted students, with an average financial aid award of over $47,000. Hamilton calls both Clinton Village and Kirkland its hometowns. The college’s Town-Gown Fund is an emblem of the close relationship between the college and the community. The fund provides grants to educational organizations in the area, including an art center, a historical society, and the town library. Known for its rigorous training and prestige, the U.S. Military Academy at West Point may not be the first place that comes to mind when you hear small town college. But West Point’s scenic campus and national landmark status, plus its relationship with the historic town of Highlands, New York, makes it one of the best small town colleges. Just 50 miles outside of New York City, West Point sits on the Hudson River and attracts tourists with its museum, visitors’ center, and events at Eisenhower Hall. The surrounding town of Highlands provides access to Bear Mountain State Park and Highland Falls, plus a long history dating back to the colonial period. George Washington helped establish fortifications where the town meets the Hudson River, which came under attack during the Battle of Fort Montgomery. Due to its relationship with West Point, Highlands remains a tourist destination in its own right. A mid-sized university in a small town, the University of Wyoming welcomes 14,000 students to its rugged, Rocky Mountain home in Laramie. A land-grant university dating back to 1886, the institution offers world-class facilities in a small town environment. Students escape campus to enjoy snowmobiling, biking, and cross-country ski trails, along with nearly 3 million acres of national forests. The city of Laramie offers a thriving downtown district, multiple parks, and a historic railroad background, all at 7,200 feet. Laramie also offers a river, museums, and an art scene in its town of 30,000 residents, earning the nickname Gem City. On Laramie Jubilee Days, students can join local residents to celebrate Wyoming statehood with a week-long rodeo and horse show. The University of Wyoming offers all the benefits of a land-grant public university in a small town setting. With a picturesque, 575-acre campus that often tops lists for the most beautiful campuses in the country, Colgate University combines academics with natural beauty. The university, home to just under 3,000 students, provides a liberal arts education in a small town setting. Colgate also commits to covering 100% of students’ demonstrated financial need. The surrounding community of Hamilton, New York, thrives due to its close relationship with Colgate. Forbes recognized Hamilton as one of America’s friendliest towns, praising the historic town for its scenic homes, holiday parties, and local university. The town also boasts a historic theater, college bookstore, and village green, connecting the university community with the town. The village green hosts farmers’ markets, festivals, and events throughout the year. Whether walking down Willow Path, climbing Cardiac Hill, or visiting historic Hamilton Village, Colgate students benefit from their small town environment. Located in McMinnville in the heart of Oregon’s wine country, Linfield College provides a liberal arts education for 2,500 students on its 189-acre wooded campus. Founded in 1858, nearly all of Linfield’s incoming freshman receive some form of financial aid. Linfield takes advantage of its location by offering an innovative combined bachelor’s and master’s in wine studies, with students earning the graduate degree from the Ecole Supérieure d’Agriculture in France. McMinnville’s central location in the Willamette Valley makes it the perfect town for wine tasting. The historic downtown district, lined with maple trees, earned McMinnville the title Best Main Street in the West from Sunset magazine. The community also supports Linfield sports, and the college’s football team boasts 62 straight winning seasons. Surrounded by rolling green hills, Linfield offers opportunities for cycling, hiking, and golf. The school is just 50 miles outside of Portland. Providing an Ivy League education in a small town atmosphere, Cornell University hosts a student population of 22,000. Located in Ithaca, New York, a town smaller than the university, Cornell’s sprawling, beautiful campus covers 2,300 acres, including Fall Creek Gorge and Cascadia Gorge. Just off campus, students benefit from over 28,000 acres of forest, perfect for hiking, skiing, and biking. Cornell also offers internationally recognized academic programs, with over 80 majors and a strong graduate program. Cornell calls Ithaca a college town with a great heart, and Ithaca Commons is the heart of the community. A pedestrian-only downtown area, Ithaca Commons hosts shops, restaurants, and annual festivals, including an apple harvest festival and a chili cook-off. Both residents and students enjoy the many lakes and waterfalls of the state’s Finger Lakes region. The marriage of Cornell’s academic excellence and Ithaca’s vibrant, natural beauty make Cornell one of the best small town colleges. Another large university in a small town, Kansas State University calls Manhattan home. With roots as Bluemont Central College, established in 1858, K-State became a public institution after Kansas earned statehood. The only land-grant university in Kansas, K-State trains undergraduates and graduate students in agriculture, engineering, and other fields. Kansas high schoolers consistently pick K-State as their top choice university in the state. Known affectionately as the Little Apple, Manhattan ranked at the top of a Princeton Review list of the best Town-Gown Relationships. The Carnegie Foundation also recognized K-State with its Community Engagement Classification, demonstrating the university’s commitment to its broader community. K-State holds the record as the town’s largest employer, while also attracting residents who cheer for its athletics program. Surrounded by the Flint Hills and overlooking the Big Blue River and the Kansas River, Manhattan offers a scenic backdrop for the world-recognized university. Located in the small town of Grinnell, Iowa, 50 miles east of Des Moines, Grinnell College offers a liberal arts education in a small town, Midwestern environment. Dating back to 1846, Grinnell provides 26 majors for its 1,600 students. The college also offers customized curriculum planning and self-designed majors. More than half of Grinnell graduates earn an advanced degree within 10 years after leaving the college. The town of Grinnell, with just over 9,000 residents, holds the nickname The Jewel of the Prairie. Founded almost a decade after the college, the town’s historic downtown features landmark architecture like the Grinnell Sullivan building. The town also boasts a historical museum, a municipal band with weekly performances every June, and events like Ag Appreciation Day. A small, walkable community, Grinnell welcomes students from the college and offers walking tours for new residents and visitors. Founded in Gambier, Ohio in 1824, Kenyon College offers a liberal arts education to its 1,600 students. The hilltop campus boasts a 500-acre nature preserve with woodlands, prairies, and wetlands along the scenic Kokosing River. As the oldest private college in Ohio, Kenyon counts among its alumni President Rutherford B. Hayes, Paul Newman, and John Green. Kenyon students choose from 33 majors and study around the world in one of 150 off-campus programs, connecting their small town college to the global community. The village of Gambier, founded by Philander Chase, who also founded Kenyon, sits 45 miles from Columbus. Gambier’s Kokosing Gap Trail offers nature walks and forest trails through Knox County. The Kenyon Middle Path connects the village to the college, serving as the pedestrian core for both. It offers opportunities for students and residents to mingle and join together as a community. Oberlin College stands out for its academic excellence and small town environment. The college and town are so close that they share a name. Tappan Square, a national historic landmark, joins the two, providing a lush green space for students and residents. Oberlin students also benefit from the local art museum, historic sites, and a close-knit community that links town and college. Known as a quintessential college town, Oberlin offers coffeehouses, bookstores, markets, and thrift shops within walking distance of campus. The town of Oberlin, with under 10,000 residents, offers quaint charm and historical architecture. Ohio Magazine named the town one of the state’s best hometowns. If students want big-city amenities, Oberlin sits just 35 miles from Cleveland. The town’s motto of “Live, Learn, Lead,” applies equally well to the world-class college. Founded in 1693, the College of William and Mary in Williamsburg, Virginia, is the second oldest college in the country. The public research university takes its name from the reigning English monarchs who chartered the institution, and today William and Mary offers a liberal arts education surrounded by history. The 1,200-acre campus, with its own lake and woods, features a historic campus section, restored to its 18th-century glory. William and Mary students represent every state in the union plus 65 foreign countries, with half of students studying abroad during their education. William and Mary’s academic strength and distinguished history marry well with Colonial Williamsburg, which attracts tourists from around the world. Boasting the world’s largest living history museum, the town also features historic taverns and two art museums. Just steps from downtown Colonial Williamsburg, the campus welcomes visitors to the Sir Christopher Wren Building, which dates back to 1700 and represents the oldest university building in the country still in use. A liberal arts college located in the rolling bluegrass hills of Danville, Kentucky, Centre College provides a tight-knit community nestled in a historic small town. In spite of its small size at just 1,450 students, Centre boasts 87 campus organizations with over 2,000 events each year, and more than 50 academic programs. Centre also brings record participation in college athletics, with 40% of students playing on a varsity team. While nearly all students live on campus, they also benefit from the amenities of Danville, which has been called one of the best small towns in the country. By taking a short walk from campus, students reach the historic downtown district of Danville, which hosts local festivals year round. The location also offers outdoor activities on the many local rivers and lakes, or students can visit a wildlife refuge to learn about conservation efforts. Nearby, Shaker Village of Pleasant Hill offers 3,000 acres of Kentucky history. Founded in 1813, Colby College overlooks the rugged beauty of the Kennebec River Valley and the town of Waterville, Maine. One of the oldest liberal arts colleges in the country, Colby is home to 2,000 students from more than 70 countries. Its academic programs promote exploration and collaborative learning. With 714 acres, students can explore campus or head down Mayflower Hill to visit Waterville. While the community may be small, it boasts a large collection of art at Colby’s Museum of Art and its own Waterville Opera House. The town hosts an international film festival, an arts festival, a food festival, and a farmers’ market. Colby students also benefit from nearby outdoor activities, including hiking the Quarry Road Trails and boating on the Kennebec River. Colby’s location places students an hour outside of Portland and even closer to Maine’s scenic coast. Located in Walla Walla, Washington, Whitman College prioritizes small classes and liberal arts values on its scenic campus. Whitman students demonstrate their commitment to the community with 70% of students participating in volunteer initiatives. The college also boasts a park-like campus with a 1:1 student-to-tree ratio. In addition to academics, Whitman students excel in sports, with 80% of students participating in intramural sports. Just three blocks away, downtown Walla Walla welcomes Whitman students. Tree-lined streets reveal cafes and bookstores, farmers’ markets, and outdoor concerts. Walla Walla, famous for its sweet onions and wine, sits at the foot of the Blue Mountains. Taking its name from the Homeland Tribe term meaning place of many waters, Walla Walla features numerous streams. The town welcomes outdoor enthusiasts and foodies year round, earning the title best small town in America and one of the friendliest places to live. Located on California’s central coast, California Polytechnic State University, or Cal Poly, offers an undergraduate education with a technical and professional emphasis. Part of the California State University system, Cal Poly welcomes over 21,000 students to its 1,300-acre campus. One of the largest land-holding universities in the country, Cal Poly counts ranch land in central California among its holdings. Cal Poly also participates in NCAA Division I athletics, taking on rival UC Santa Barbara. The surrounding town of San Luis Obispo, which is 10 miles from the Pacific, boasts miles of beaches, wine and food offerings, a vibrant art scene, and outdoor activities for residents, students, and visitors. The natural setting welcomes whales, sea otters, and seals year round, with monarch butterflies migrating past San Luis Obispo each winter. Nestled in the rich farmland of Greencastle, Indiana, DePauw University boasts a campus of over 695 acres. Students at the liberal arts institution can attend concerts, lecture series, and athletic events, and the university’s nature park offers over nine miles of trails. Nearby, one of Indiana’s biggest waterfalls provides added natural beauty. Greencastle’s historic downtown district offers a local theater, a farmers’ market, and cultural events for students, all within walking distance of campus. The town and the university share such a close relationship that the university’s official bookstore, Eli’s Books, is found not on campus but in the town. Greencastle’s historic buildings find their mirror in DePauw’s East College, the oldest part of campus, which dates back to 1877. Featured on the National Register of Historic Places, students at DePauw are surrounded by beautiful architecture. Students can reach Indianapolis or Bloomington within an hour. Established in 1846, Bucknell University offers more than 50 majors for its 3,600 undergraduate students, with a particularly strong record in engineering. Bucknell’s 450-acre campus features classical architecture surrounded by natural beauty, located on the west bank of the Susquehanna River. Nearby Susquehanna Valley offers scenic trails and rivers for students who want to escape campus. The university boasts a high retention rate and a well above average graduation rate, demonstrating student satisfaction. Bucknell calls historic Lewisburg, Pennsylvania, home, with much of Bucknell’s campus being part of the town’s historic district, recognized on the National Register of Historic Places. Lewisburg counts over 870 historic buildings in its district, including numerous Victorian homes, laid out on the classic Colonial Pennsylvania town square model. The town also hosts a music and craft festival, features multiple museums, and offers welcoming cafes and coffee shops for students. It may be the largest school on the list, but don’t let its size fool you––the University of Mississippi remains a small town college thanks to its home in Oxford. Ole Miss counts nearly 25,000 students, making its campus population larger than the 23,000 resident population of Oxford. Known for its long history and strong academics, Ole Miss dates back to 1848. Thanks to its close relationship with the university, Oxford earned the nickname Cultural Mecca of the South. The charming town counts William Faulkner among its historic residents, and today the author’s Nobel Prize-winning legacy attracts a community of writers. Ole Miss students can escape campus to enjoy award-winning restaurants and visit the historic downtown square. Combining the southern charm of Oxford with cutting-edge academics, Ole Miss appeals to students seeking a world-class education in a small town environment. A public university in a small town setting, Slippery Rock University began as a teaching college in 1889. Today, the university offers undergraduate and graduate programs for 8,500 students in Western Pennsylvania. The 660-acre campus hosts an annual arts festival, boasts over 150 clubs and organizations, and offers a rock climbing wall. Just off campus, students can visit the North Country Scenic Trail or wander through the picturesque village of Slippery Rock. An hour outside of Pittsburgh, Slippery Rock recently received a $4 million grant to revitalize the town. With colorfully painted storefronts, old-fashioned street lamps, and a gazebo, the town offers an appealing break from the rigorous academic atmosphere at the university. The town praises its close connection with the university for attracting speakers, offering performing arts events, and building the college town atmosphere. 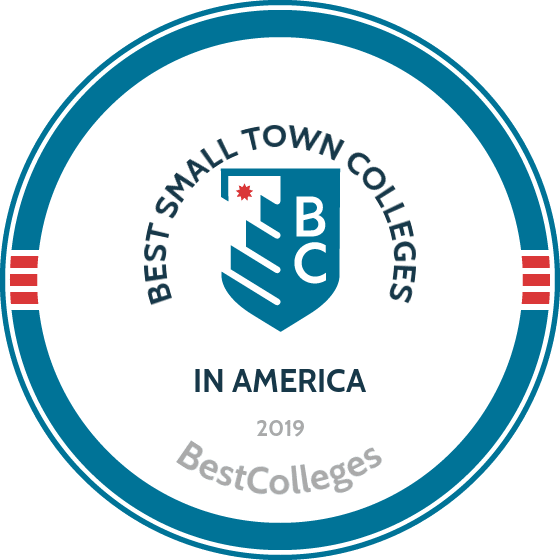 This list uses several measures to rank the best small town colleges, such as shared historic districts and community engagement initiatives, as well as the town’s natural surroundings and history. Students often choose small town colleges to escape the bustle of city life, so a friendly, welcoming environment with easy access to the outdoors places the following schools on the list. The methodology also considers access to the amenities of a city, such as a major airport for Thanksgiving trips home. The best small town colleges must also have a reputation for academic excellence.